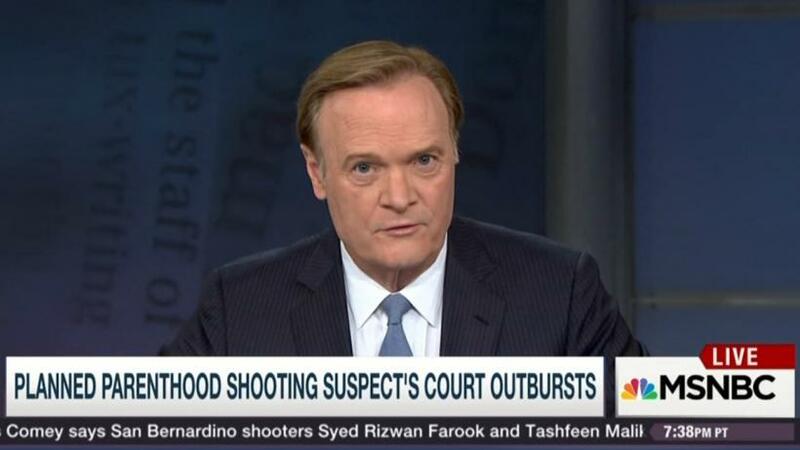 (Newsbusters) “Millions” from the pro-life movement are on board with the Planned Parenthood shooter, MSNBC host Lawrence O’Donnell accused on his show Dec. 9. During Wednesday’s The Last Word with Lawrence O’Donnell, the host spoke with Planned Parenthood President Cecile Richards on the shooting Nov. 27 that killed three people and wounded nine at one of the abortion provider’s Colorado clinics. The gunman, Robert Dear, appeared in court for the first time Wednesday, facing 179 felony charges including first-degree murder. While in court, Dear continuously interrupted court procedure with his own commentary. “I’m guilty,” he said at one point. “There’s no trial. I’m a warrior for babies.” O’Donnell played a montage of clips from the trial and asked Richards for her thoughts on Dear’s performance. O’Donnell then played another clip where Dear insisted that his lawyer and Planned Parenthood were working together against him. “Cecile, there’s a murderer who’s begun the day by confessing to the murder,” O’Donnell relayed, “and saying that ‘Planned Parenthood and my lawyer are in cahoots to shut me up.’” And “millions” agree, he went on to say, presumably referring to the pro-life movement (which has denounced Dear, by the way). “I know that there are millions of protesters out there who share his view of this situation – who are going to believe that that is exactly true,” O’Donnell stated. Richards disagreed. “I don’t actually think there are millions of people who believe what he’s saying are true,” she said, before changing the subject. Never a good sign when your own side is calling you out, Mr. O’Donnell.